As Prime Minister Justin Trudeau, Alberta Premier Rachel Notley and British Columbia Premier John Horgan prepare for the emergency pipeline summit, the dominant discourse in mainstream and social media has been about Alberta’s economic needs and whether or not the BC government is overstepping its constitutional jurisdiction with its proposed diluted bitumen regulation. Those two issues are unquestionably critical, but there are two larger issues looming at the summit: Alberta’s climate challenge and indigenous reconciliation. No one at the summit will be representing these latter two issues but they are undeniably elephants in the room. One of the more remarkable things about the Trans Mountain conversation has been Trudeau and Notley’s claim that the pipeline project is a climate solution. It is true that in the short term, politically, getting Alberta’s participation in the Pan-Canadian Framework on Clean Growth and Climate Change was not possible without Trudeau committing to push forward a new pipeline. But the longer-term problem is that it’s hard to square the oil sands expansion planned by Alberta and enabled by the Trans Mountain project with Canada’s UN commitment to the international community to reduce emission by 30% (below 2005 levels) by 2030. The current policies that make up the Pan-Canadian Framework are not sufficient for Canada to meet its 2030 goals. It’s hard to see how Canada can meet that target without reductions from Alberta, whose much-celebrated Climate Leadership Plan does not reduce emissions through 2030 (report, p. 10). Even more important when discussing long-lived investments like pipelines, for Canada to be a responsible global citizen in contributing the long-term climate goals, post-2030 reductions in emissions will have to be much steeper. The challenge all along is that the Alberta oil sands fueled model of economic development is simply not sustainable as we shift to a low-carbon, clean energy future. Sooner or later the Governments of Alberta and Canada need to reckon with this reality. Trudeau’s Pan-Canadian Framework, by buying Alberta’s participation with an emissions-expanding pipeline, simply postpones the necessary task of dealing with this reality. 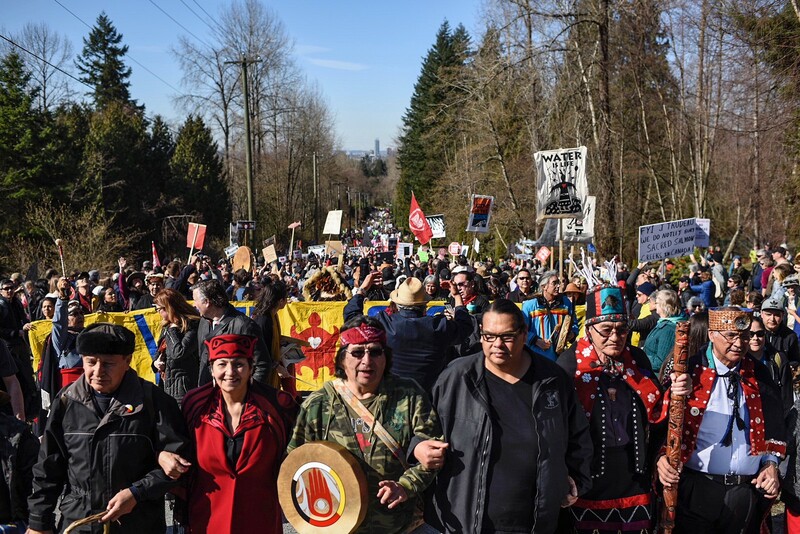 By approving the pipeline, Trudeau chose to imposes the costs and risks on British Columbia, for which there will be an electoral backlash form the west coast. But if Trudeau is serious about climate leadership, or even simply compliance with Canada’s 2030 targets, he’ll need to reckon with the Alberta problem. There’s really no other alternative than beginning the transition away from the oil sands as the core driver of the province’s economy. That will be costly — socially, economic and politically. Notley certainly doesn’t want to deal with this issue. Trudeau doesn’t either. Horgan has undermined his ability to represent the climate case when he changed the province’s policy framework in an effort to attract a major LNG project, and by advocating increased domestic refining as an alternative to a pipeline to export raw bitumen. Nonetheless, Canada and Alberta’s climate challenge loom large over the emergency meeting. The other elephant in the room is Canada’s challenge in reconciling settler governments with its indigenous peoples. One of the cornerstones of Trudeau’s election campaign has been building a government to government relationship with aboriginal people. Yet while three settler government leaders sit down to discuss the fate of a project of great to concern to many of Canada’s First Nations, no First Nations leadership will be present at the summit. 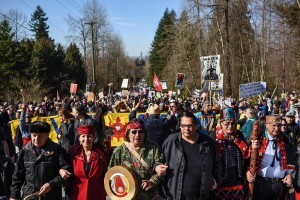 The Governments of Alberta and Canada are rushing to help Kinder Morgan ramp up summer construction even before courts have ruled on multiple lawsuits against the project by First Nations. All three settler governments attending the summit have committed to fully implementing the UN Declaration on the Rights of Indigenous Peoples (UNDRIP). Yet there is a still a huge gulf in understanding of what role First Nations should play in project decision-making. Existing Canadian law, and the expectations of all three settler governments, is that Crown governments have an obligation to consult with and accommodate First Nations, but the consent of First Nations is not required for projects to go forward. In contrast, First Nations believe that UNDRIP’s provision of “free, prior, and informed consent” from indigenous groups means what it says: First Nations consent is required for a project to go forward in their traditional territories. Each of Canada’s oil sands pipeline proposals has ran into the same process pathology: individual projects have been transformed into proxy battles over broader issues about Canadian climate policy and indigenous rights. The fact that both issues are being ignored in the emergency pipeline summit does not mean that they are any less important or that they are going to go away. Canada is long overdue for serious conversations about reconciling settler and aboriginal title and Alberta’s economic model with a low-carbon future. Let’s hope the gathering of political leadership at the pipeline summit advances those two conversations. This entry was posted in Climate Action Policy, Energy Pipelines. Bookmark the permalink.